Reporting On Mass Shootings: A Familiar Heartbreaking Script In the past year, NPR's Leila Fadel has had to report on the mass shooting in Las Vegas, and last week's shooting in Thousand Oaks, Calif., that left 13 dead, including the gunman. 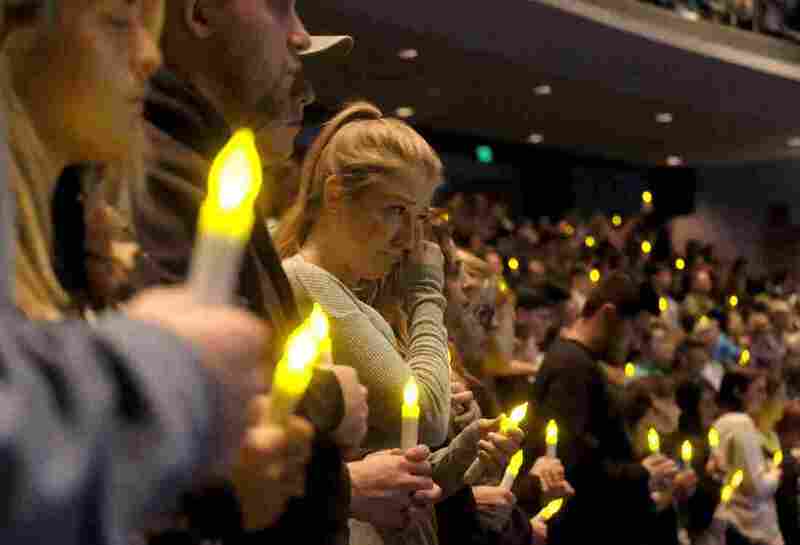 People gather to pray for the victims of a mass shooting during a candlelight vigil in Thousand Oaks, Calif., Thursday, Nov. 8, 2018. A gunman opened fire Wednesday evening inside a country music bar, killing multiple people, including a responding sheriff's sergeant. This past week there was yet another tragic mass shooting, this time at the Borderline Bar and Grill in Thousand Oaks, Calif. Twelve people were killed before the gunman fatally turned the gun on himself. It's an all too common scene. According to the Gun Violence Archive, which defines mass shootings as an incident in which four or more people are killed or injured, there was one almost every day of the past two weeks, another just Saturday in Tennessee. And as journalists, we are now covering mass shootings not once, not twice but repeatedly as they happen more frequently across the country. And we're finding people who've been through more than one in their lifetime. It starts with a phone call, usually in the middle of the night. You know without looking at the screen of your phone. You know that somewhere, someone has chosen to kill a lot of people. Now your job is to go bear witness. To try to tell the world why, speak to grieving families on the worst days of their lives so that millions of people can mourn with them and know the beautiful details of what makes a person special, what families and loved ones remember about their relatives who were killed. This past week I learned about a college freshman who was beyond excited to vote for the first time, a navy veteran who loved line dancing, and the people who died because they stayed behind to help others live. These days it feels like these shootings follow a familiar and heartbreaking script. First, the press conference where law enforcement officers tell their community what's happened and reassure them that everything will be OK. Like Ventura County Sheriff Geoff Dean did this week before he retired. One of his own men was among the dead: Sgt. Ron Helus, who responded to the shooting first and died trying to stop it. Then there are the families scrambling to find out if their loved ones lived or died. Like Marc Orfanos whose son Telemachus, already a survivor of the Las Vegas mass shooting, was at the bar. Marc got a phone call at 2 a.m. from a friend in New York who knew that his son, who the family calls Tel, frequents the bar. They rushed there. A friend said he thought Tel got out. But 10 hours later the Orfanos found out their 27-year-old son didn't survive. And now a video of his mother, Susan, has gone viral as she demands gun control. Inside this bar, Tel died the second time he was in the wrong place at the wrong time. Several other people at the bar that night had survived Las Vegas and now survived this. It was a shooting that I also covered. Maybe I met some of them when I talked to survivors then. As the identities of victims are revealed, the grieving begins, and the community comes together. There are the piles of teddy bears, crosses, letters, candles and tears. The vigils with different renditions of "Amazing Grace." And in the back of your mind you know that it will happen, again and again and again. Since returning to the United States in 2016 from reporting in the Middle East for more than a decade, I've covered three mass shootings in just over a year. I thought I'd left this type of violence behind me in war-torn countries like Iraq, Libya and Syria. But my stateside colleagues and I share the responsibilities of documenting these horrific incidents and the aftermath. Like NPR's Nate Rott, who's covered eight mass shootings for NPR. "The best word I can think to describe how I feel when I have to go cover one of these things, is just deflated," he said. "You feel like you're telling the same story over and over and over with different places and different names and maybe different reason. I think the hardest thing recently is this sense of inevitability that you hear from people. People aren't necessarily surprised that it happened. There's this sense, 'Well, it was only a matter of time before it happened here,' and as a human that's really hard to hear." It makes me think of working in Iraq, which I did for many years. In the years between 2006 and 2010, the bombings were so common that we stopped reporting on incidents that took less than 10 lives. Think about that — 10 lives lost, and it wasn't shocking anymore, wasn't newsworthy. It was a terrifying but steady part of life. People grew numb to the carnage, they didn't let it sink in, didn't want to hear about the impact of loss. It was easier for people to stop paying attention. 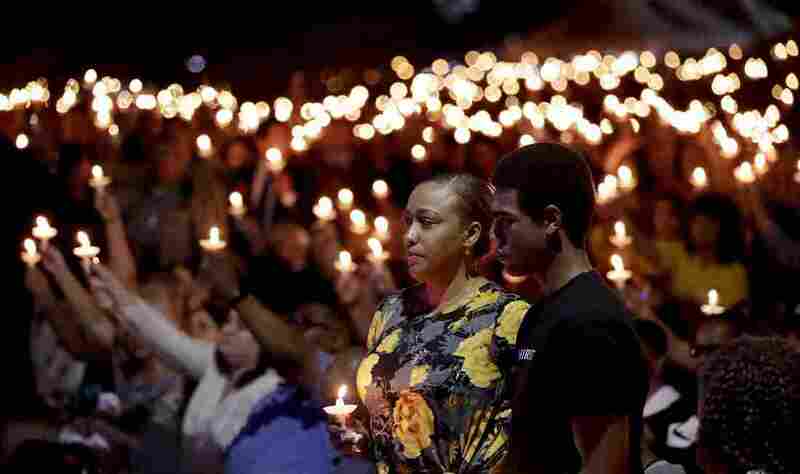 Veronica Hartfield stands with her son Ayzayah Hartfield during a candlelight vigil for her husband, Las Vegas police officer Charleston Hartfield, Thursday, Oct. 5, 2017, in Las Vegas. Hartfield was killed during the shooting at the Route 91 Harvest country music festival. "Why someone does something like this?" As journalists, we also want to provide information that the public wants to know. I know as a human being, I always want to know why someone does something like this, decides to pick up a gun and steal precious lives from us. Finding the answer to that question usually falls to people like my NPR colleague Martin Kaste. He covers law enforcement and typically is the reporter looking for all the information we can find about the shooter. "I'm getting really worried about that. There is research showing that talking too much about the shooter, talking about his motives, can inspire other shooters," Kaste said. Of course, there is some journalistic value to looking at motive, a person might be driven by some ideology, racism, hatred of a specific group of people. But often, like the case was in Las Vegas, there is no why, and maybe we shouldn't ask why. "Well, I think we need to stop assuming there is something interesting to be said about why someone did this," Kaste said. "I think a lot of times these are empty gestures of violence that we should not dignify with the assumption that there is a reason behind it that needs to be discussed and shared with millions of people." So we've started saying the shooter's name as few times as possible, instead focusing our reporting on families, the stories of victims, on policy debates. There's something else about covering these tragedies that makes them really difficult. I hate walking up to the door of a family who I know is mourning. Who I know has lost someone they loved so much in such a sudden and horrific way. But I knock on those doors, I have to knock. Because I want them to be able to tell their story to the world if they want the world to know it. Because I want to give them the option of a platform to talk about their family member, their concerns about violence. I want them to have an opportunity, but it sometimes feels wrong. And you never know if the person on the other side of that door will be enraged by you or if they've been waiting for someone to just ask them, 'Tell me about your child, or partner, or parent." There's a helplessness to this work of bearing witness to something so terrible. It's something NPR's Hansi Lo Wang and I have talked about many times. "As a reporter, I wonder, does bearing witness and telling people around the country the hurt, the death, the destruction, is that enough?" he asked. We all ask ourselves, is this our new normal, this inexcusable business of carnage? How do we keep witnessing these things without growing an impenetrable skin so that the horrors of what is happening can't sink in? So that we don't have to face grief head on. So that we as a society can be numb. But we need to fight against that numbness so that it never becomes normal, so that it doesn't become a steady part of life. So that we still cry when we see pain, and we still ask how do we stop this?